Home ice was the remedy the Toronto Maple Leafs needed after a big loss in Game 2 to the Boston Bruins, followed by the suspension of forward Nazem Kadri. Kadri, who was suspended following a cross check to the head of Bruins’ forward Jake DeBrusk, was handed a ban from the remainder of the first round leaving the Maple Leafs with an open spot up front. Enter Tyler Ennis, who – while he wasn’t a major role player in Monday’s Game 3 victory – did add speed and tenacity to a lineup already eager to put their Game 2 performance behind them. That said, others did step up in Kadri’s absence while some continued to perform well as they’ve done throughout the first round. With that, here are four takeaways from the Maple Leafs 3-2 win in Game 3. He’s arguably been the best player for the Maple Leafs so far this series with back-to-back 37-save performances in Game 1 and 2 followed by a 34-save Game 3. But it’s the quality of the saves that are more important. So far, through three games, he has a 3.04 goals saved above average (GSSA) and he’s come up big in key situations for his team. 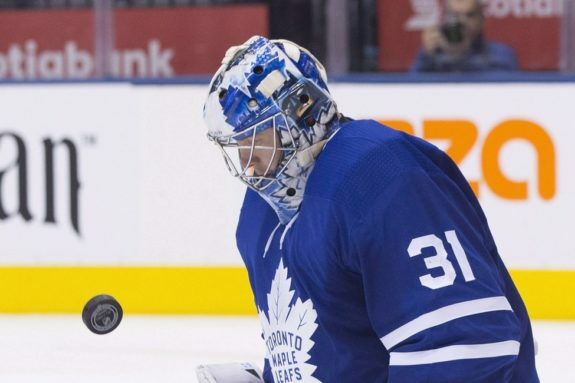 While he can only protect the Maple Leafs in one area of play, the Leafs’ goaltender has shown more this year than last year’s series against the Bruins. Not only have we seen glimpses of brilliance from Andersen in the past three games, but he seems to be the difference the Maple Leafs have needed through the first few games. Even in their loss in Game 2, it was saves made by Andersen that kept the score remotely reasonable. It was said from the start, if the Maple Leafs stand a chance of beating the Bruins, it’ll come down to them playing as a unit in front of Andersen with the goaltender being the major difference maker. And so far, that’s been the case. We talked about Andersen, but how about another Maple Leaf that was willing to put his body on the line to make a couple saves? If you missed the dying seconds of Game 3, you missed two key blocks at the blue line by forward Mitch Marner. One that knocked the forward down, the second was made while he was sprawling on the ground in front of two slappers from David Pastrnak. His sacrifice was recognized by his teammates following the horn as the Maple Leafs players mobbed him before heading to thank Andersen for his efforts. Marner has easily been the best player on the ice for the blue and white not named Andersen. He’s averaged over a minute more of ice-time in the playoffs than during the regular season, according to The Athletic’s Scott Wheeler, and played more than anyone in Game 3 aside from Morgan Rielly. In a contract year, he’s put everything on the line to help the Maple Leafs get past the Bruins this season and extinguish the fire that has brought down the Leafs in years past. With Kadri out, the Maple Leafs needed someone else to step up. Andreas Johnsson took on that challenge and ran – or rather, skated – with it. He stepped in on the team’s top power play unit and took advantage of the opportunity. Johnsson played nearly 19 minutes, including just over two minutes on the Maple Leafs three power plays and it paid off. Not only did he assist on the team’s first power play tally – scored by Auston Matthews – but the 24-year-old added a power play tuck of his own with just under three minutes left in the second period. While he’s small, the Maple Leafs will need Johnsson to bring that intensity that he played with in Game 3 the rest of the way if they are going to find a way past the Bruins. With Kadri out, it’ll be depth guys like Johnsson who will put this team over the top on their way to the second round. Finally, while his offence hasn’t exactly been the talking point of the first three games, John Tavares is contributing in other ways. Playing a smarter game, he’s gone to the dirty areas in front of the Boston net and even forced Charlie McAvoy to push him into Tuukka Rask during Game 3. Add that to his nearly 20 minutes of ice time and power play time, and he’s proving to be an important piece for the Maple Leafs even without adding as much offence as expected. But possibly the most telling stat is what he’s done in the face-off dot. He finished at 63% in the dot in Game 3 and that included 10 for 16 against Patrice Bergeron who is one of the game’s top face-off guys at 56.6% during the regular season. Either way, it might be one of the stats we don’t talk about as often, but it’ll be a key one if the Maple Leafs want to continue their success in Game 4, when the Bruins and Maple Leafs hit the ice again in Toronto at Scotiabank Arena.